Denver's Jamal Murray takes a shot with a second left in a 115-107 game, and that's an unwritten no-no. DENVER — Mark it up to the exuberance of youth. 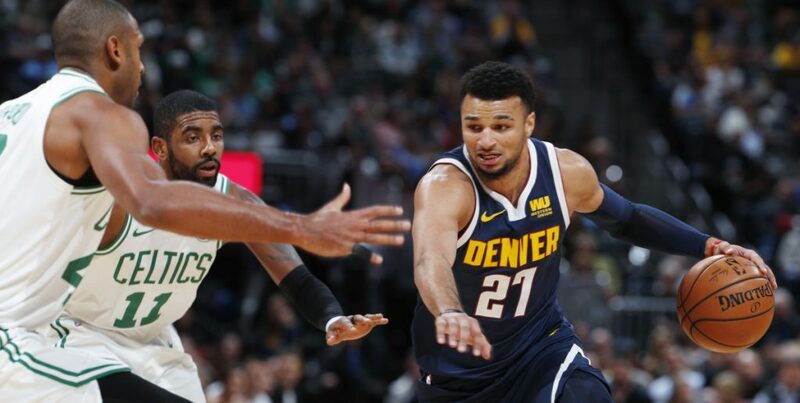 Jamal Murray, a little tipsy on the tail end of his 48-point night, hoisted one final, meaningless pull-up 3-pointer with a second left in the Denver Nuggets’ 115-107 victory over the Boston Celtics on Monday night. An enraged Kyrie Irving grabbed the rebound and unleashed a hoist of his own – into the stands. “I mean, what kind of competitor wouldn’t it bother?” said Irving, who was fined $25,000 on Tuesday for throwing the ball in the stands. “I understand if we fouled him, going to the free-throw line. I don’t want to make a big deal out of it. Obviously I was pissed at the game, but it’s time to decompress and move on. Congratulations to him having 48 points. He did it in a great fashion against us. Our defense has to be better, especially against a player like that in the pick-and-roll. He was the primary concern tonight and he made us pay in certain instances. Murray apologized during his live interview on the court. The Celtics are officially on their first losing streak of the season. They are also off to an 0-2 start on this five-city trip. Boston has been slayed twice in as many games by scorers who have been able to find an easy rhythm against their defense. Indiana’s Victor Oladipo hit a winning 3-pointer with 3.4 seconds left Saturday night, and Murray was on fire Monday night. The Celtics thus squandered a great night by Irving, who matched his season high with 31 points. Too few other Celtics were able to muster offensive support. Jayson Tatum (15 points) and Gordon Hayward (eight points, nine rebounds) shot a combined 8 for 21. Morris, in a rare off night, shot 3 for 9 and missed all four of his 3-point attempts. It was only the second time in 10 games that Morris has gone without a trey. Irving has focused on becoming a better defender this season. And while the Celtics’ guard has been noticeably active in the defensive end, he’s also fallen prey to calls, with NBA officials bearing down on most kinds of contact this season. Irving’s three-foul first half Saturday night in Indiana effectively limited his role in a tight loss. He understands, for example, that teams will try even more off switches to isolate him in the post against bigger players. The ploy worked in Indiana. Isaiah Thomas, hood pulled over his head to be discreet, visited the Celtics’ locker room before the game. Thomas, after reading comments from Stevens about the point guard’s time with the Celtics, tweeted out love for the coach. Like Denver Coach Mike Malone, who also coached Thomas in Sacramento, Stevens will always be one of Thomas’ favorites. Both men scored high with Thomas because of their willingness to let him play his game. According to Malone, Thomas is now bringing a familiar quality to the Nuggets’ locker room. “Just leadership,” Malone said. “Obviously my history with Isaiah, coaching him in Sacramento, the relationship that we have, even while he’s not playing, he’s still had a profound impact on our young players. His voice, his leadership in huddles during games and practices and in the locker room. We have a relatively quiet group, and I think one thing everybody knows from being around Isaiah is that he’s not quiet, and that’s a good thing for our team. He brings that energy and a voice and a leadership we sorely miss. Brown has been dealing with soreness in the top of his right foot, and he’s not having much luck with the orthotic device inserted into his sneaker to boot. So he has changed devices again. “The orthotics kind of hurt, they took the pressure off of where it was supposed to, but they added pressure to where it wasn’t supposed to, so it was kind of hurting my feet, but I’m going to stay on top of it and go back to the other ones,” he said.